Darren and Chelsea celebrated their wedding day with their friends and family last Saturday. The weather turned a tad chilly as winter finally arrived in Johannesburg. 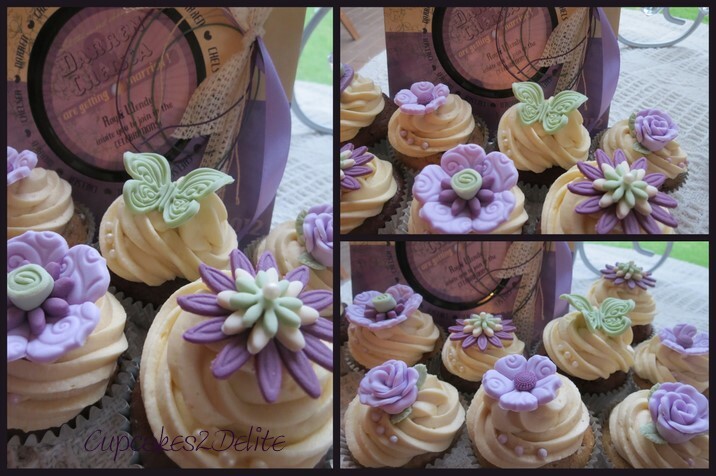 They had chosen a perfect colour scheme for this time of year, lavender, cream & plum with a touch of green and Wendy asked me to do the cupcakes in these colours. 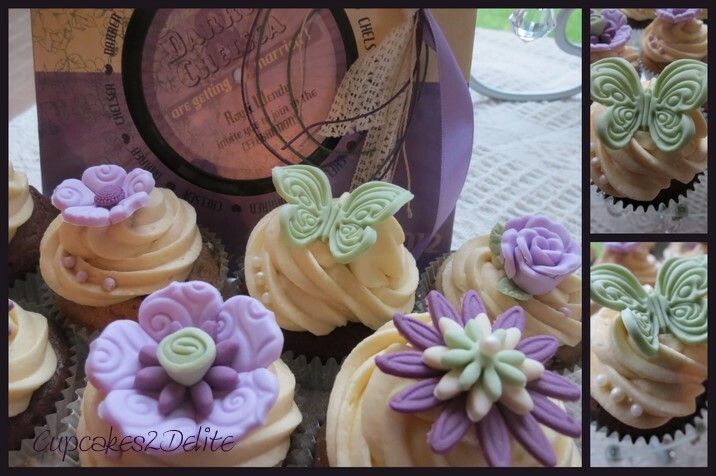 The flavours they chose were lavender, amarula, cappuccino and chocolate and they were excited to let me experiment with different sugarpaste decorations for the cupcakes. As you can see in the backdrop of the photos above Darren and Chelsea had a quirky and unique wedding invitation in the form of a small record in a sleeve with all the event details printed on it. 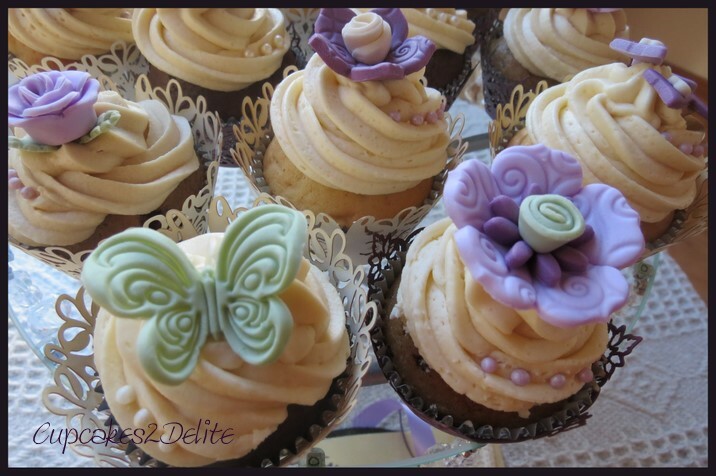 I made funky flowers, roses, butterflies and music notes in their colours and popped a different one on each cupcake with a couple of sugar pearls for effect. I put some of the cupcakes into filigree cupcake holders in cream and plum and the overall result was fun, young and pretty. I was so delighted to be able to do these cupcakes for Darren and Chelsea’s wedding as I have known Darren for a few years now since my son, Teigh, started taking drum lessons with him. Darren is not only a brilliant musician and drummer but he is an exceptional young man in the humble yet passionate way he teaches his students. He has a wonderful influence on all his students and his calm, fun and professional manner endears him to all those who meet him. Music was Darren’s passion in life until he met Chelsea and in her he has found someone who shares his love for music. Darren and Chelsea may your married life together be filled with song and laughter and loads of cupcakes of course for all your celebrations together! Lisa’s cupcakes are legendary in our home as she has given my son, Darren, a few as gifts over the years. It seemed so perfect to ask her to stretch her creativity and make the perfect cake ensemble for his recent wedding to Chels. We served the cakes around an ice cream cake as part of the dessert buffet, and they were PERFECT! Each was a masterpiece in itself and the overall effect (arranged on cake stands) was gorgeous! Thanks, Lisa, for so perfectly interpreting the vintage theme and bringing in their musical, lace and pearl elements! You’re a star! 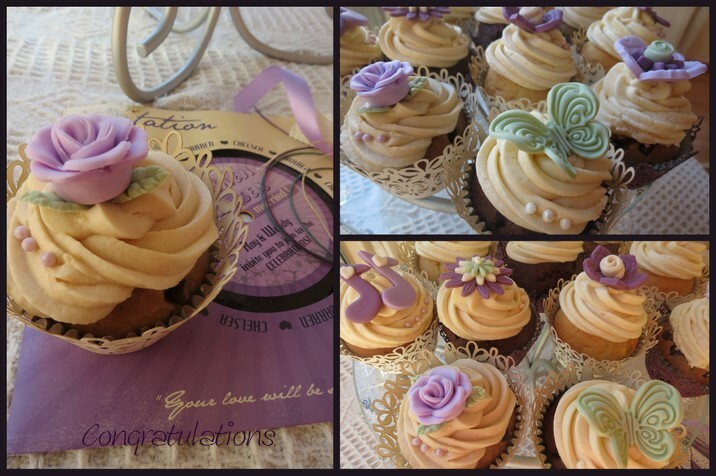 You are welcome Wendy and it was fun to do these cupcakes for such a special day and thanks for all your attention to detail and care you put into your cupcake order.